Scarf or shawl has always been important attribute of the female wardrobe, like a warm gentle wrapping gives a feeling of softness and comfort. How many man-made products made by skilled hands. And of course, an indispensable decoration of any edge of the shawl is fringe or tassels. There are several ways that allow you to make tassels for shawls, and each of them has its original and beautiful. If the shawl already made, and there was the finishing touch in the form of brushes, that would require threads of the same textures and colors. 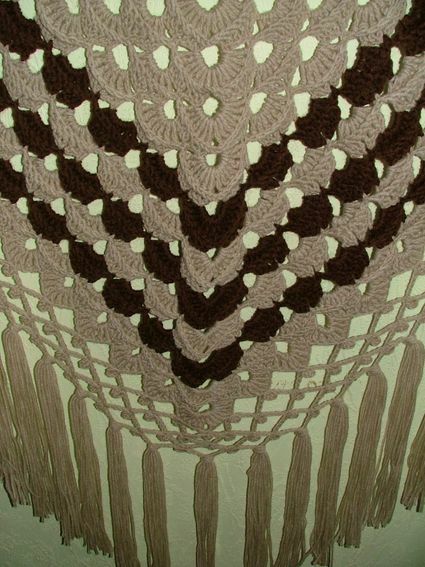 If the shawl is knitted from the yarn of several colors, and brushes you can use the same thread. Before you do brush, you need to cut parts, which get quite a large number. In the manufacture of consider their length, so the calculation does such a thread, which corresponds to twice the length of the brush. For example, the selected length of the brush is 15 cm, therefore, need to make lengths of 30 cm it is Also necessary to consider how "fuzzy" each tassel, and, on this basis, to calculate the volumes of cut blanks. For example, the brush will contain 10 threads, therefore, for its production will need 5 pieces. In order to make it easy to make harvesting, pick up a book with a width of about 15 cm, Then take a skein of yarn and start to wind evenly across the width of the book. After that, on the one hand, cut the wound yarn. The result is a workpiece of the necessary size. If an insufficient number of them, then do the same manipulation several times. This method eliminates the time-consuming process of manufacturing the brush under the line. For the formation of brushes merge threads 5 pieces, then take each bundle in the middle, pass the hook over the edge of the shawl, grab the middle of the intended brush and pull a loop through the edge thread. So brush up on the shawl. Continue to perform the same manipulations at regular intervals. The smaller will make the distance between the brush, the fluffier and fuller it will look fringe on the product. After all the brushes are fixed on the edge of the shawl, trim them with scissors. You can slightly modify the resulting decoration. In this case, two adjacent brushes will divide into 2 parts and connect the node. So continue to bind each of the neighboring brush. As a result of their can be done in the form of a braided network that will help to make note of originality to the decoration cozy beautiful products.